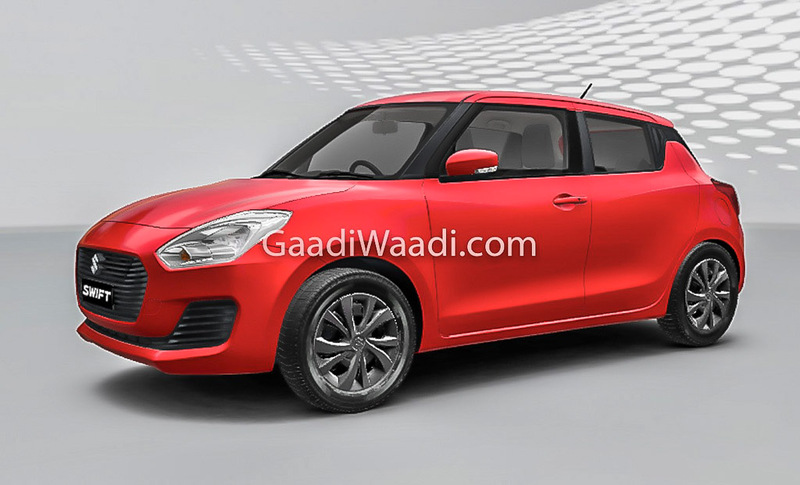 Maruti Suzuki has officially announced that the Swift sales crossed 2 million units since its launch in 2005 as the hatchback is so popular across the country even though it is slightly focused towards driving. The Swift achieved the half-million sales mark in September 2010 and in three years time, the hatchback crossed one million sales milestone. 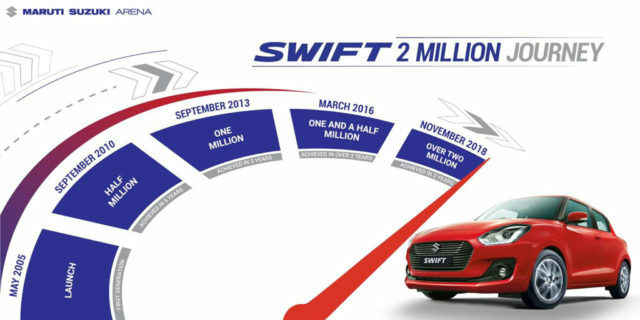 The Swift continued its good growth as the one and a half million was completed in March 2016 and the 2 million milestone was achieved within three years, which shows the popularity of the model. The hatchback is currently in its third generation in India and the breakthrough for the model came with the introduction of the diesel engine in 2007. The new generation of Swift was launched in February and the hatchback is India’s fastest car to reach one lakh sales milestone. 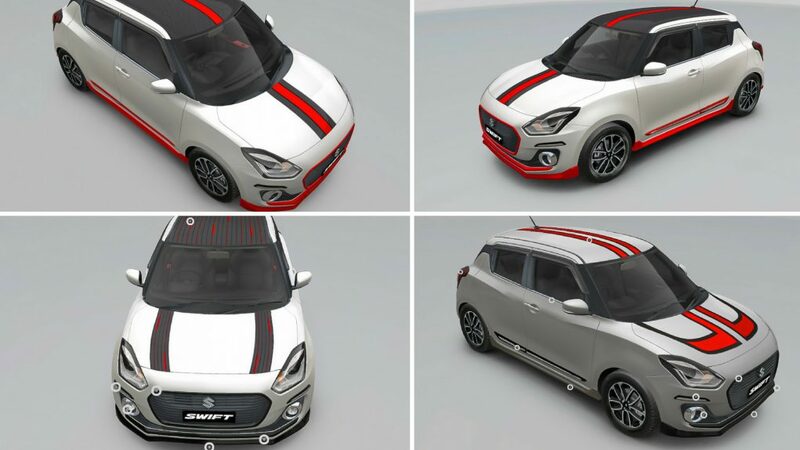 Maruti increased the production of new Swift by 45 per cent to 1.39 lakh unit during the April-Oct 2018-19, as against the previous year and the Swift also registered sales growth of 36 per cent at the same time. Maruti Suzuki crossed the 20 million milestone in India on June 4 2018, and the Swift was the 20 millionth car produced in India. The third generation Swift is based on new Heartect platform, which helped the company to shed some weight over its predecessor and they have given an evolutionary design theme. The front gets new headlamps along with an updated black-finished grille and a new design for the bumper while the side continues the similar design theme of earlier models and the handles for rear door is placed on a different position. The rear gets redesigned tail lamps along with an updated bumper. The interior gets a completely new design theme and the company has given a new three-spoke flat-bottom steering wheel. The new Swift is bigger than earlier model and the hatchback is loaded with features like touchscreen infotainment system with Apple CarPlay and Android Auto, climate control, projector headlamps, reverse camera and more. The Swift is powered by both petrol and diesel engine option, the 1.2 L K-Series engine produces 82 bhp of power at 6,000 rpm and 113 Nm of torque at 4,200 rpm. The 1.3 L DDiS engine sourced from Fiat puts out 74 bhp at 4,000 rpm and 190 Nm at 2,000 rpm. These engines are mated to a 5-speed manual and AMT gearbox. The hatchback is priced between Rs. 4.99 lakh and Rs. 8.76 lakh (both prices, Ex-Showroom).